How Do I Get From Gatwick Airport to London? Gatwick is located approximately 30 miles to the south of central London. 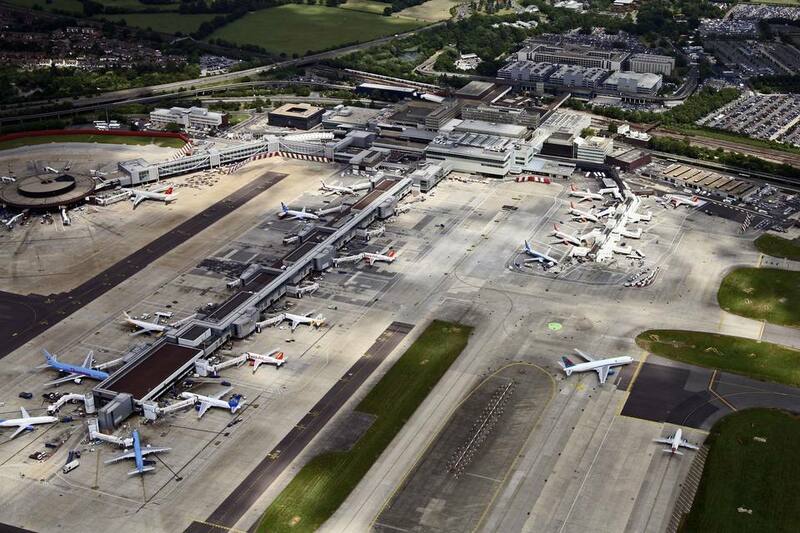 London Gatwick (LGW) is the second largest airport in the UK after Heathrow. The two terminals, North and South, are linked by an efficient monorail service, with a journey time of two minutes. The Gatwick Express is the quickest way into central London. The station is in the South Terminal and linked to other parts by escalators and lifts. Gatwick Express operates four trains per hour to and from London Victoria, with a journey time of 30 minutes. There is no service between 12:32 a.m. and 3:30 a.m. from London and between 1:35 a.m. and 4:35 p.m. from Gatwick. Other rail operators run services through the night. Fares are from £17.80 for a single ticket. Note that you can no longer buy your ticket on the train, but instead you can book online and use the self-service machines to print your ticket. Since the start of 2016, you can also use contactless payment (by touching a bank card with the contactless payment symbol on the card reader) or Oyster card for pay as you go travel between Gatwick Airport and London on the Gatwick Express. These "pay as you go" options give you the most flexibility if you are in a rush as you don’t need to queue to buy a ticket. Do remember to touch your card (Oyster card or accepted bank card) on the yellow card reader at the start of your journey, and use the same card to touch out again at the end. You will automatically be charged the right fare for the trip you’ve made (deducted directly from your bank account or Oyster card's balance). If you are making a return journey, it is cheaper to buy a paper return ticket online and then print it out at the self-service vending machines. Southern also runs a rail service to London Bridge and Victoria, with four trains an hour. The journey to Victoria takes about 30 minutes and costs from £17 for a single ticket. National Express operates an hourly coach service to and from Victoria Coach Station. The fastest journey time is around 80 minutes. Fares are from £8. easyBus operates from 3:00 a.m. to 11:25 p.m. and Gatwick (North and South Terminals) from 4:25 a.m. to 1:10 a.m. The journey time is around 65 minutes. Online fares are always better than paying the driver. Prices start at £4 for a single ticket. There is a choice of private shuttle options. If you need a larger vehicle, to be able to carry 6-8 passengers, this larger vehicle airport shuttle option is best. If you need a standard-size vehicle airport shuttle, this company can offer a 24-hour service. If you would like to arrive in style, there are private executive transfers available. And if you'd want a set-price shared transfer from the airport to your hotel that's available too. All can be booked through Viator. You can usually find a queue of black cabs at both terminals. The fare is metered but watch for extra charges such as late night or weekend journeys. Tipping is not compulsory, but 10 percent is considered the norm. Expect to pay at least £100 to get to Central London. Only use a reputable mini-cab and never use unauthorized drivers who offer their services at airports or stations.